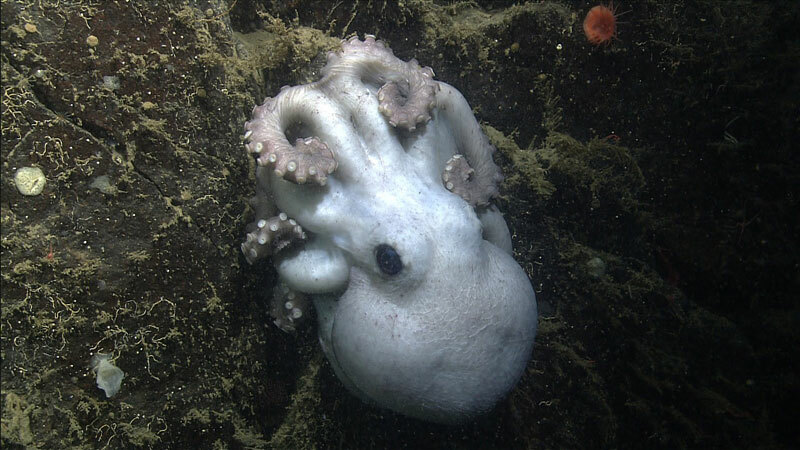 Researchers at the Monterey Bay Aquarium Research Institute (MBARI) have observed a deep-sea octopus brooding its eggs for four and one half years—longer than any other known animal. Throughout this time, the female kept the eggs clean and guarded them from predators. This amazing feat represents an evolutionary balancing act between the benefits to the young octopuses of having plenty of time to develop within their eggs, and their mother’s ability to survive for years with little or no food. Although long-term observations of deep-sea animals are rare, the researchers propose that extended brooding periods may be common in the deep sea. Such extended life stages would need to be taken into account in assessing the effects of human activities on deep-sea animals. In any case, this strategy has apparently worked for Graneledone boreopacifica—it is one of the most common deep-sea octopuses in the Northeastern Pacific. You can read a full press release of this fascinating research here.